There’s a new black metal band in town called Wergild and I was asked to design a logo for them — which is what I did. Below I’ll break down the process of designing it. Full disclosure: At the time of writing, I’m not sure if any of the logos seen here will see actual use. But that’s not relevant for this breakdown. First thing I did was establish a sense of symmetry. Why? Because black metallers usually have a hard-on for symmetrical logos. I liked the logo’s silhouette, but something was amiss with the overall shape of the letters. The letter “W” in particular bothered me. As you can see above, it reads more like a “C” or an “N,” so I needed to remedy that. Also, I decided on making things a bit more jaggy and messy-looking. Generally speaking, this is not a must per se. In fact, plenty of black metal logo designs are neat and tight in design. But one of the band members expressed a preference for something a bit more illegible. So one simple solution is to simply keep the letters black, placed on a contrasting white background that follows the silhouette of the logo. As you can see, I also added some goatheads and a screaming skull because — just because, really. No, that’s not entirely true. It’s part homage to Christophe Spzajdel, the self-proclaimed “Lord of Logos,” whose logo-designs for Horna and Tsjuder have been of inspiration to me, and part conscious design choice to help improve the silhouette. A friend of mine suggested I make some changes to the way the “S” connected to the “L,” and I felt she might be onto something. So I tried it out by giving the “L” a slight portrusion on the bottom. And while I was at it, I also tweaked the outlines a bit and flattened the coloring a bit to make it all more even and balanced. For comparison — here’s the previous version before all the tweaking. Let me know which version you prefer. In the meanwhile, I’ll continue with my next project(s). A few days ago I began on a journey to improve my thrash game. At the time of writing, I was under the impression that I never tried my hands in designing a thrash metal logo. But sometime between then and now, it came to me again that I have actually tried to design one — on two occasions, no less. That is to say, I have been commissioned twice, by two different thrash metal bands, to design a logo. Both times I failed to deliver what was expected of me. The thing is, at the time, I believed in a one-size-fits-all approach. I had developed my own signature style, and though it was really only suited for black and death metal, I was confident that I could make it work for any band in any genre of music. But I know better now. Now I know that if you want to design a logo for a thrash metal band — well, it’s probably a good idea to design a logo that could pass for a logo a thrash metal band might actually use! Now, after a few days of practicing, I’m confident that I have the skills necessary to design a proper thrash metal logo. And to prove it, here’s Slave Machinery, v.2! Alright, so we’ve got a thrash metal logo. What can I say about it? Well, for starters, I ‘ve always liked the whole idea of a single-tier logo with blocky, angular letters that are — really or seemingly — connected, using a thick line underneath or on top. Not only heightens it the sense of solidity of an already solid typographic core — it also adds a bit of zest to an otherwise perhaps humdrum, type-like logo. Not that there’s anything wrong with that per se — it never held Iron Maiden back from making it big. But then, they have one of the most iconic logos in the “metal mainstream” — or period, for that matter. I’m only saying, think about all the angles, reflect on what you can do to make your logo more interesting or more appropriate to the genre. When I say you have to think about all the angles, I mean that quite literally. I’ve been looking at a lot of logos of 1980s and retro-inspired thrash metal bands (like, e.g., Dark Angel, Sadus, Toxic Holocaust, Violator), and I found that most are entirely composed of letters with angles instead of curves. It is important to note that this is by no means a hard and fast rule. One of the bigger bands in the thrash genre, Exodus for instance, has a logo with hardly any angled straights to speak of. But all this probably isn’t news to anyone entrenched in the scene. What might be surprising, though, is that you will specifically find a lot of 30-, 40-, and, to a lesser degree, 60-degree letter angles. Looking back at my previous version (see below), I feel that I at least got the angles right — but that’s the only thing that’s right. My biggest grip with it is that is too wavy. The constant up and down undermines the solidity that I feel a thrash metal logo needs to have. I also feel that it’s better to have but a few outlying accents extending into to open surrouding space, because an undulating mass doesn’t make for a strong silhouette. One thing I haven’t talked about yet is negative space. Negative space is the empty space that surrounds an object or, if you will, a positive shape. I once read somewhere that the negative space is what makes people make out letters. I will come back to this later when I discuss black metal logo design, but suffice to say here that when you’re designing a thrash metal logo, you may want to reduce the negative space to a bare minimum, aligning them and squeezing them together — ideally to the point where you can practically only make out the letters by looking at the negative space in the letters themselves. And that’s another problem I see with the logo above. While the spacing between the letters is satisfactorily small — to me, the letters don’t feel boxed in enough. So those were two of the things that I tried to remedy with the re-design, and hopefully I succeeded. What do you think? Which version do you like best? Let me know in the comments. I’m still obsessed with improving my thrash game. But I’m beginning to get the hang of it. I know now the right angles, and I think I know how to handle the negative space. Hopefully, sometime this weekend, I get to finish the logo — one of them, and then I’ll write some stuff on how to make one yourself. I was thinking of following up on my previous entry, explaining what I set out to with my latest cartoon. Instead, I decided on writing an update on what I’ve been doing lately. So what have I been up to? Well, I’m back to designing band art. Now, I can’t share everything — you know how it is, what with some bands wanting to reveal their logo or album cover in a special manner. But there’s stuff I can show you! Take this Marquis of Snakes logo, for example. On Twitter I jokingly remarked that I like my metal as I like my stilettos — black and pointy, much like a logo. The joke fell flat. (That’s Twitter for you!) But there is a truth to it. As much as I like soft, soothing music, I also like sharp and pointy black metal. Now, while I’m not as deeply entrenched in the black metal underground as I used to be — ever since I moved to Bergen, Norway, I find myself increasingly drawn to black metal again — which is also why, of course, I’m going to Beyond the Gates this August. What has any of this to do with the logo above? Well, I’ve been wanting to design a real, proper black metal logo for some time now — especially now that I live in a Norwegian town that is, basically, the capital of the black metal scene. 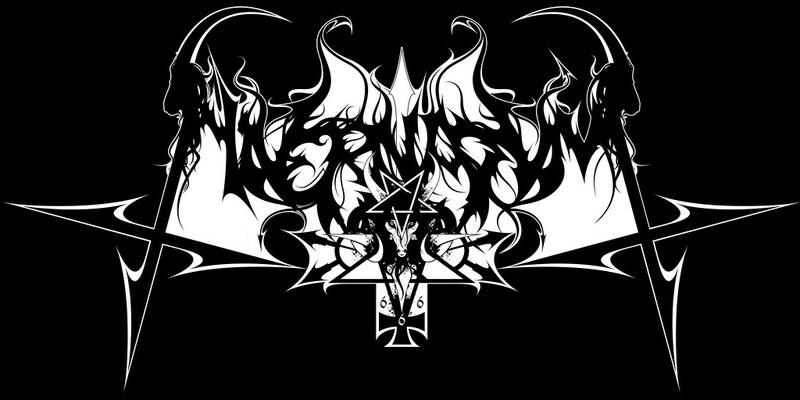 You see, over the years, I’ve designed mostly death metal logos, and what few times I designed a black metal logo — it was probably a parody logo (see the Hivernatum logo below), so I’ve been lacking a good black metal piece for my portfolio. But that’s about to change. The Marquis of Snakes logo is going to be one hell of a logo — and I’m going to have it printed on a shirt so I can wear it to Beyond the Gates! I’ll be my own walking advertisement, and it will be great! So there’s that, but there’s more to the story. For instance, why Marquis of Snakes? I remember watching The Conjuring 2, the slightly disappointing sequel to — well, The Conjuring, and the only thing that really stuck out to me was the name of the film’s main antagonist — Valak, a demon whose title is — that’s right, you guessed it! — Marquis of Snakes. I figured I could turn it into a logo that genuinely screams “black metal,” and some initial sketching proved it a viable idea (see below). A few hours later I finished the lettering. And now — well, now I’m thinking of adding some more graphics to it, in order to take it to the next level. I’m not talking here of some goatheads or a winged Baphomet, or any other stuff that bear no congruence to the name and what it implies — no, I’m thinking snakes, a fallen cherub, or something like that. Whatever. Anyway, the logo should — probably, or at least hopefully — be finished sometime later this week. So stay tuned — because I’m sure it’ll be a lot more fun to look at it than watching The Conjuring 2 in its entirety! So, uh, I made this illustration some time ago for Witches of Dune, an alternative, all-female rock band from the Netherlands. It’s just a neat, simple design. But it made for a welcome change from my usual work.